Well, ok. 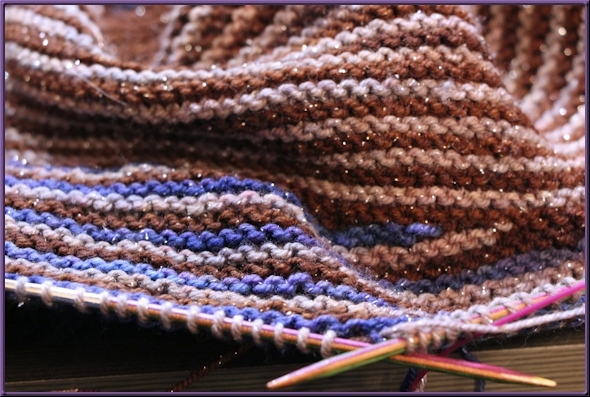 Section Three (the short rows) section of my Color Affection shawl is well underway. And I’ve realized, now that I can see the proverbial light at the end of the knitting black hole (how’s THAT for mixing metaphors?) that I’ve made an error in judgement. I am a habitually loose knitter, so I always knit with a needle that is way smaller than the pattern usually calls for. But in this case, with this shawl? I probably shouldn’t have gone as small as I did. The thing is huge from end to end, but skinny, I mean scarf skinny, from top to bottom. I’m going to have to add an extra repeat of short rows to add depth to the thing. And maybe make the bottom border bigger, too. This is not what I wanted to have to do, add more rows just as I am getting so sick of this project I could die from the boredom. But alas I want it to be a large wrap that my friend can curl up in. So, I’ll have to get creative about it. I’m more determined than ever to finish, though, and have made a point to knit as much as possible every day. I’ve been re-listening to some steamy audiobooks to pass the time, and I finally caved and started watching Downton Abbey. Ok, so I know I’m late to THAT particular party, but in a way I’m glad that I can plow through the episodes at my own ravenous pace rather than having to wait for the next installment like everyone else. Of course, I will get to the end soon enough, and then I’ll be waiting just like the rest of you for it to start up again. But hopefully, by the time that happens, I’ll be on to another knitting project. This one is now plaguing me. And I can’t wait to be done with it. I’m working on a stole from a Lion Brand pattern. My gauge is fine, but I didn’t realize how skinny it was going to be. I like the pattern, but when this one is finished I’m going to make another one but with a couple pattern repeats.